Mike Tyson will present fellow former boxing heavyweight champion Evander Holyfield with a trophy commemorating his induction the Nevada Boxing Hall of Fame Aug. 9, according to a new report. The two rivals have come a long way since their bitter in-ring feud that culminated in Tyson twice biting Holyfield's ear during a fight in 1997, resulting in his disqualification. The fight was a rematch of their 1996 bout, which Holyfield won via stoppage. Tyson called the opportunity to meet with Holyfield again and help induct him into the Nevada Hall a "privilege and high honor." Holyfield was seemingly more subdued but no-doubt sincere in saying, of Tyson's involvement, "that's great." 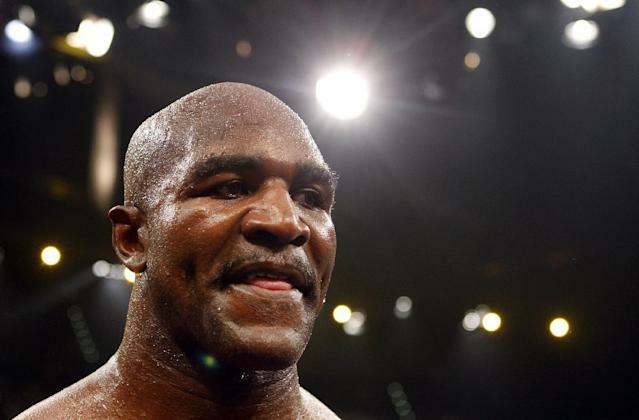 Holyfield will be inducted in the non-resident category of Nevada's boxing hall, along with former champs George Foreman and Roberto Duran. Additionally, many other fighters are being inducted in various categories this year, including Sonny Liston, Archie Moore and Jack Dempsey. Tyson himself was inducted last year in the resident category. Tyson last fought in 2005, losing to Kevin McBride. Holyfield last fought and won in 2011, scoring a TKO win over Brian Nielsen.